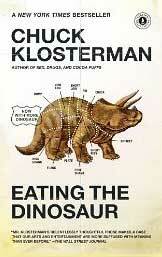 This is the first collection of Chuck Klosterman’s work that I’ve read though it won’t be the last. I think he’s really nailed something important about how fame, celebrity and media work today in the excerpt above. Especially when he writes, “We use them for things that are worth more than money.” Scary. But true, I think.